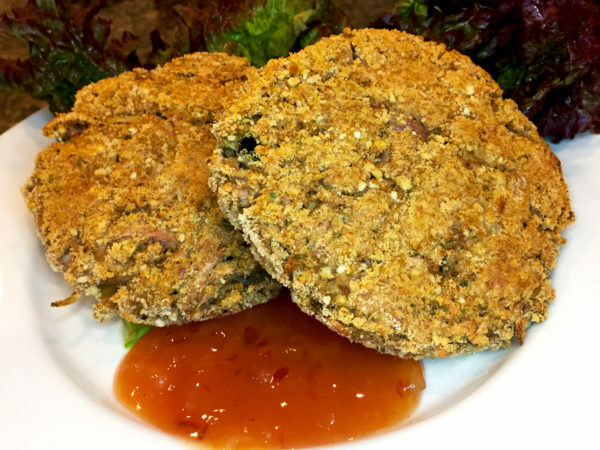 These Jackfruit Crab Cakes are a savory substitute for conventional crab cakes. 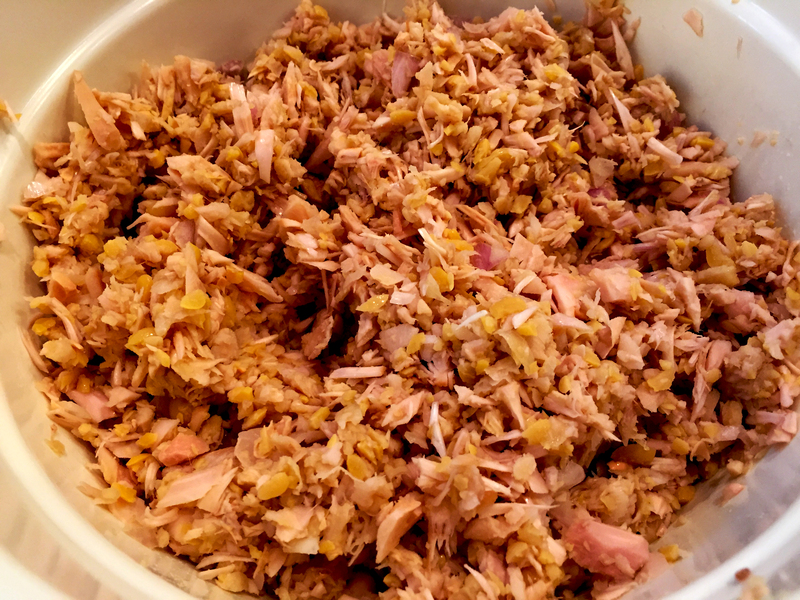 Jackfruit has a mild flavor that takes on the flavors of your seasonings so it’s a good replacement for most types of shredded meat. The dried seaweed is the key to achieving a seafood flavor and aroma so don’t skip it. We found it in the Asian foods section of our Natural Grocers, and I know Whole Foods carries it too. The Old Bay seasoning was more difficult to find. We finally found it at a small Asian grocery store not to far from our house. I guess that’s not a popular seasoning in the Denver metro. It’s probably much easier to find in other parts of the country. Amelia made some delicious Thai Style Sweet and Spicy Sauce to go with these, but you can use your favorite non-dairy condiment. 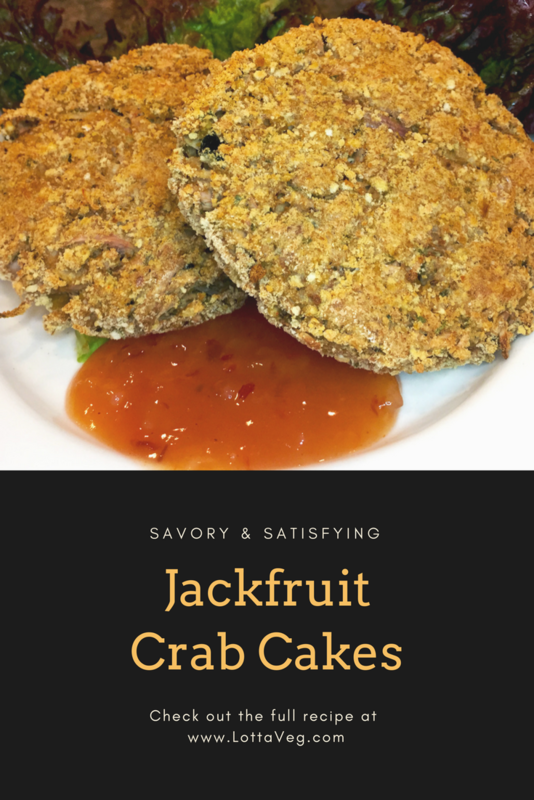 These Jackfruit Crab Cakes are a savory substitute for conventional crab cakes. Enjoy with some delicious Thai Style Sweet and Spicy Sauce. Combine flaxmeal and water in a small bowl. Mix well and set aside to let thicken, about 10 minutes. Combine jackfruit, garbanzo beans and the shallot in a food processor. Pulse to a coarse chop. Don't over process. Place contents from food processor in a large mixing bowl. Add seasonings and flax eggs and stir to thoroughly combine. Divide mixture in 8 balls and form into patties. 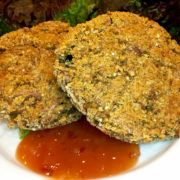 If using bread crumbs, place crumbs on a large plate. Place one patty on the crumbs and press gently to coat. Carefully flip the patty and coat the other side. Repeat for all patties and place on a baking sheet. Place the baking sheet with the patties in the refrigerator and cool for 30 minutes. Remove from the refrigerator and let stand for 5 minutes to warm up the baking sheet slightly. Bake for 15-20 minutes or until browned. Carefully flip the patties and bake another 15-20 minutes. Enjoy with some Thai Style Sweet and Spicy Sauce or your favorite dipping sauce. Serving size is 2 Jackfruit Crab Cakes.